they might go out of style. This one had seemed like a fun one. I liked the tentacles on the cover. It gave an impression of being something to look forward to. The premis seemed fun too. A guy with 5 historical spirits trapped within that were happy to kill him as help him. There was certainly a lot of action in this. And there were parts that were fun. But it was also shallow and cliche. And to much drama for drama's sake and not much to develop the story. It just leaps and leaps to things and most of it really seems pointless. They could have done a better job of fleshing things out but they didn't. The Big Box of Trade Books arrived safely today; many thanks! I asked for this one largely on the strength of the cover-art; will see how I like the interior! Later: OK, so there were some stock elements here, but I enjoyed the story anyway - the mix of characters was entertaining, and if I'd have preferred a more complex study of how one might host such disparate personalities, well, I was happy enough with the story here. It did present the "oops, now you're de-powered"/"aha, now you're not" bits too fast, but then again it kept things moving. 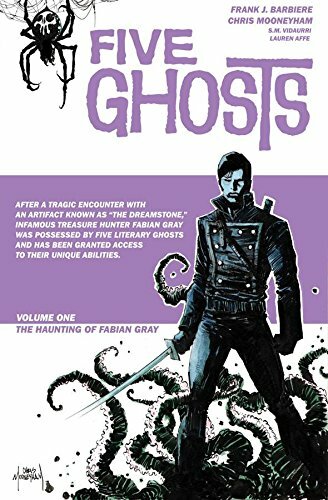 And I adored Fabian's pal/sidekick Sebastian, who somehow survives all the nastiness despite not having any helpful literary ghosts to help him out; his quip about "This is why I hate adventures" made me laugh out loud. 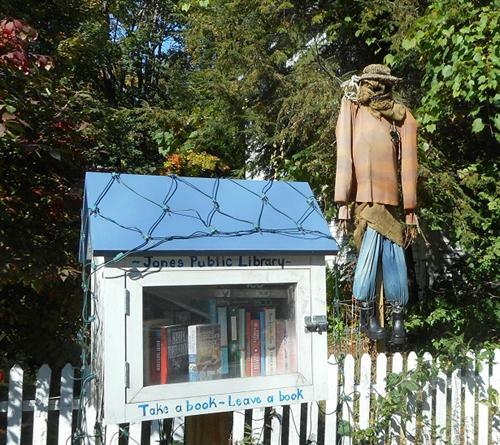 I left this book in the Little Free Library, after spotting it while driving by - it was the creepy scarecrow behind it that really got my attention. Hope someone enjoys the book!